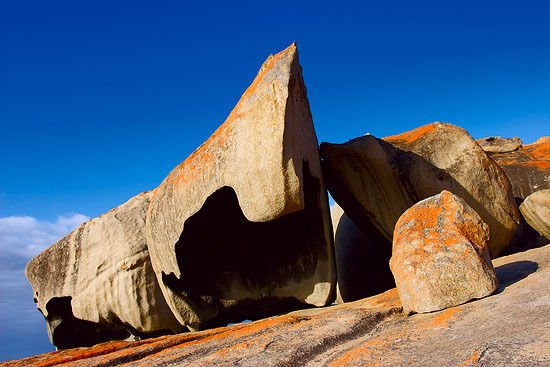 Remarkable Rocks is a group of granite boulders on the top of the granite dome located in the western part of the island within the Flinders Chase National Park. To get to this truly remarkable place drive along the Cape Du Couedic Road from the park entrance and then turn left onto the Boxer Drive. There are a lot of animals in the area especially during the dark hours, so be careful: drive slowly, be prepared to stop and reserve enough time – approximately 30 minutes during the day, and about 40 minutes if you go there for a sunrise. At the end of the road there is a large car park and a start of the boardwalk. It takes less than 10 minutes to get to the rocks from the car park. Formation of these rocks has started some time in the post Cambrian period (500 million years ago), boulders were formed by the rain penetrating the upper layer of the rock, decomposing it into separate boulders. Wind, ocean waves and lichen have helped the erosion process, creating these impressive sculptures of different shapes and sizes. Detailed formation process has described on the board next to the Remarkable Rocks. 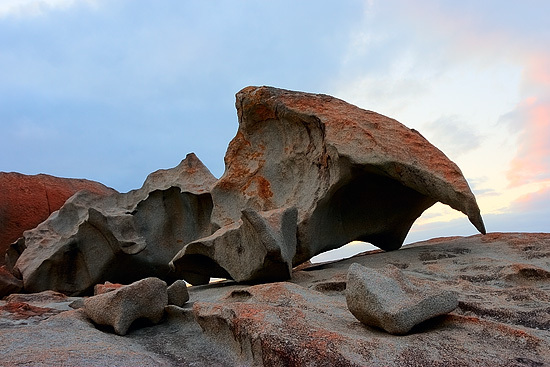 The base of the Remarkable Rocks is quite flat and easy to walk on (especially on dry weather), but be extremely careful – the southern side of the base is very steep and there is nothing that can stop you from falling into the ocean (except of couple warning signs). Be also prepared for a strong wind, weather changes and ocean waves. 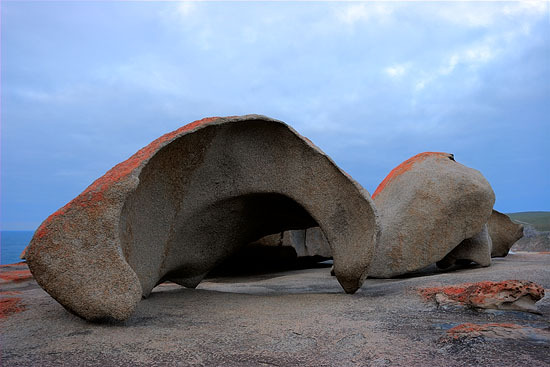 Kangaroo Island is a third largest island in Australia, located in 110 kilometres from Adelaide, South Australia. Island is 150 km long and 57 km wide (in its’ widest point) and just 18 kilometres from Cape Jervis, where you can catch a ferry to get from the mainland to the island.